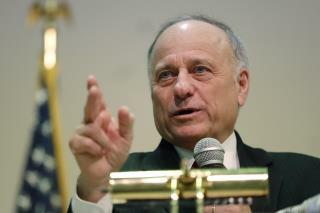 (Newser) – Iowa congressman Steve King may be used to hearing criticism over controversial statements, but that criticism took a much more personal turn on Friday. Police in Fort Dodge, Iowa, arrested a man after they say he threw a glass of water on King at a restaurant, reports KCCI. Blake Gibbins, 26, went to the table where King was eating lunch with a group of people and threw the water when King confirmed he was the GOP congressman, say police, per ABC News. Gibbins faces charges of simple assault and disorderly conduct.